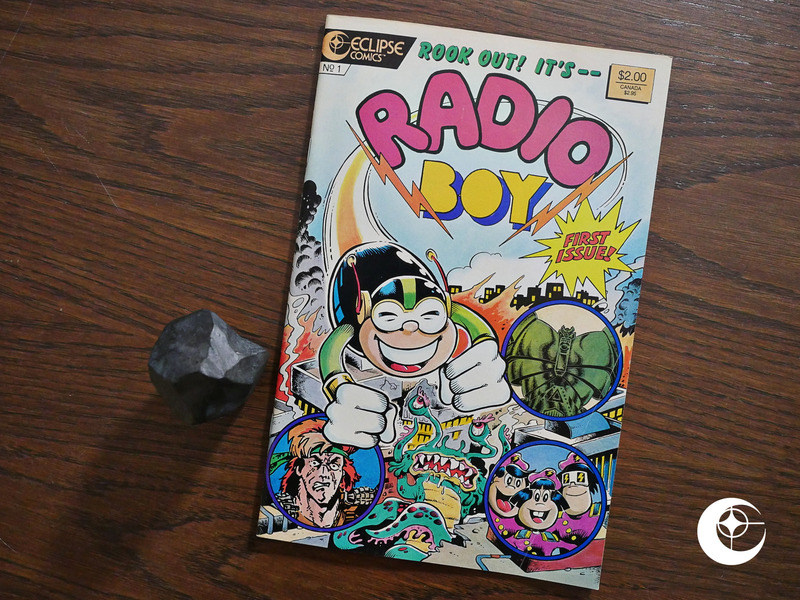 Radio Boy (1987) #1 by Chuck Dixon, Jim Engel, Flint Henry, et al. We’re getting to the end of an era: The black and white boom has gone bust, and Eclipse would withdraw from this market soon, and approach a new, lucrative idea soon: Japanese comics. Just two months after this book, Eclipse would start its assault on the US comics market with three bimonthly translations (Area 88, Kamui and Mai, the Psychic Girl), so I assumed that this was a way of testing the waters. It’s nothing of the kind. 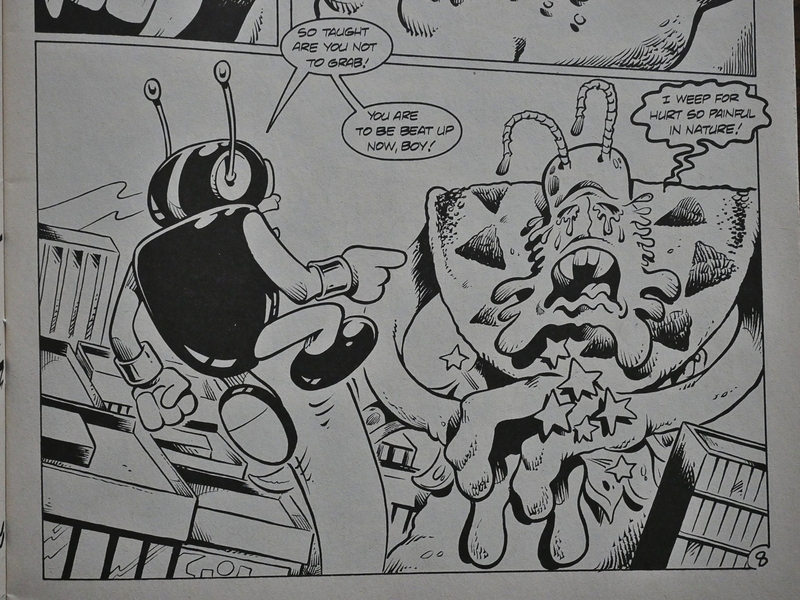 Bizarrely enough, it’s ostensibly a parody of Japanese comics (and Osamu Tezuka’s Astro Boy in particular) published months before the vast majority of the US comics-reading audience had even seen a Japanese comic book. 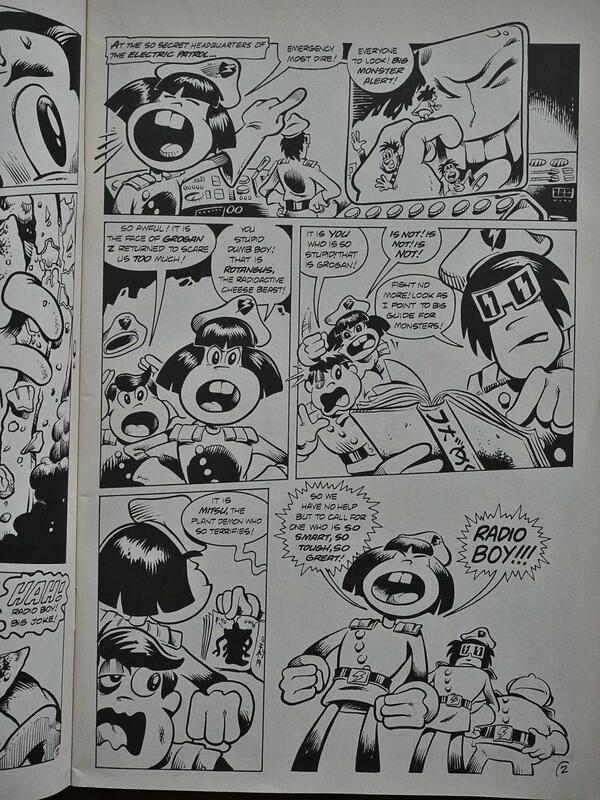 And reading it, it becomes clear that the creators of Radio Boy haven’t seen a Japanese comic book, either. I’m guessing from the stilted English that they have seen badly dubbed versions of Godzilla, though. Or perhaps they’ve just read about somebody having seen badly dubbed versions of Godzilla, because it’s just painful to read. The two shorter backup features are funnier and look slightly more Japanese. But that’s just because nothing looked less Japanese than the main story. 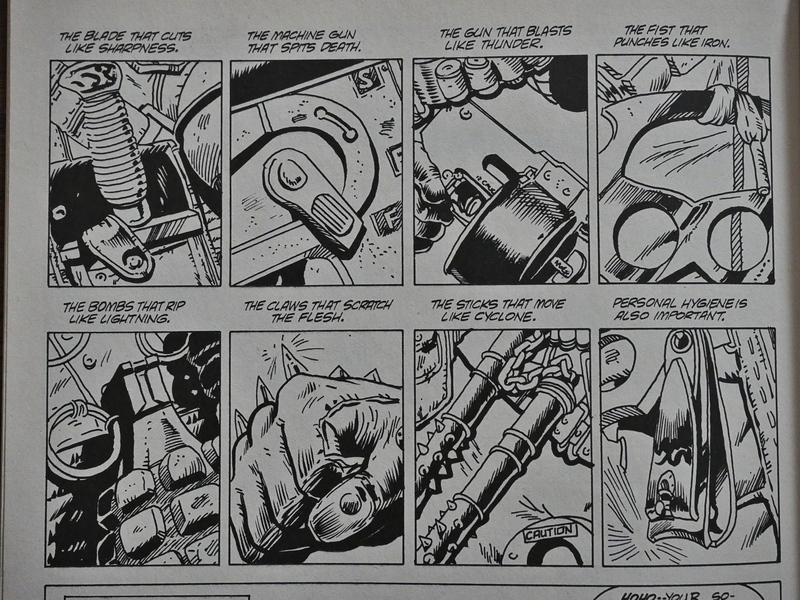 The last one is inked by Timothy Truman and has a couple of jokes that work, but, not to harp on the same point over and over… That looks more like a European montage sequence. 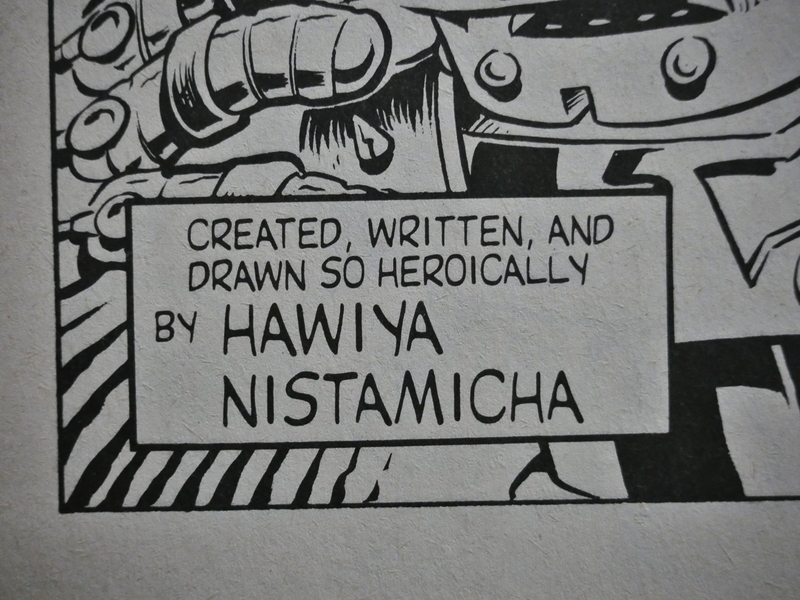 They do namecheck Tezuka in the Jim Engel-penned biography of the purported creator of these comics Hawiya Nistamicha (get it? huh? huh? 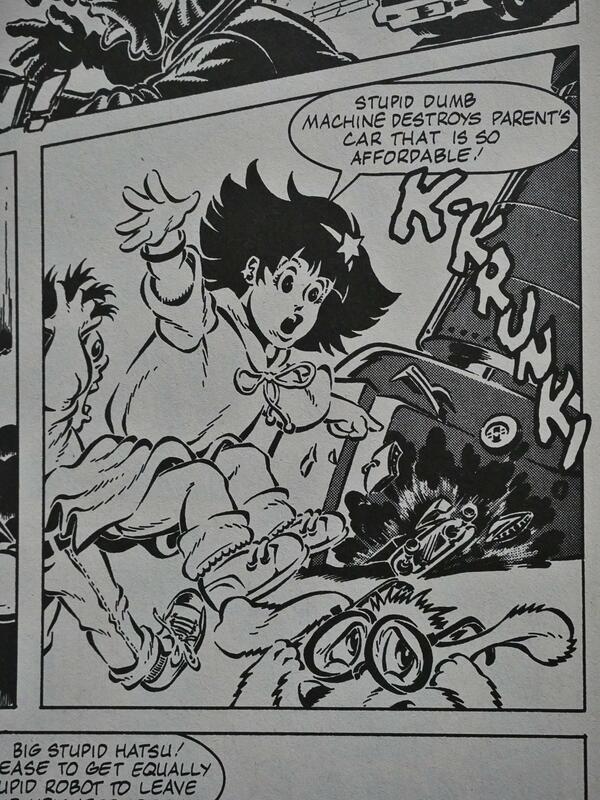 ), and it does show that they aren’t as unfamiliar with Tezuka as I had assumed after reading the comics. 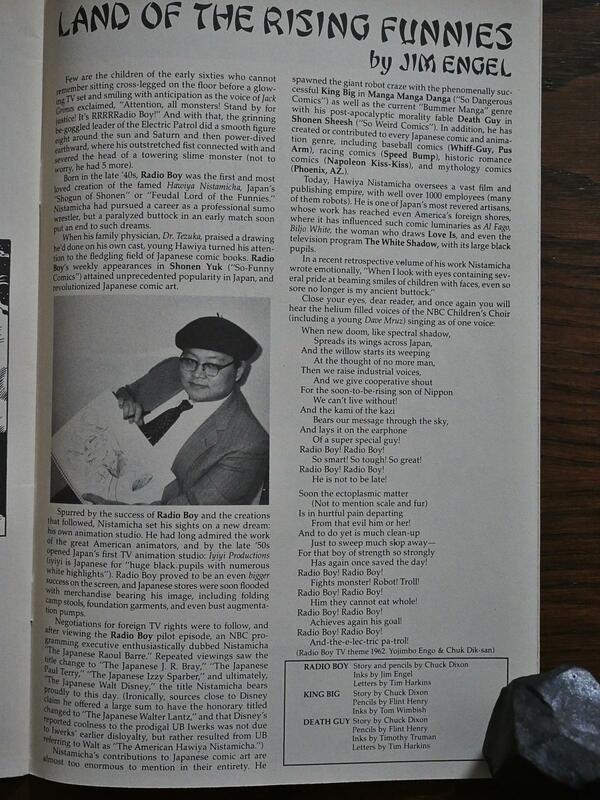 The bit about the various “The Japanese”, going through Paul Terry and Izzy Sparber before settling on “The Japanese Walt Disney” is funny, and citing “the woman who draws Love Is” as a person who’s influenced by him is, too. It’s such a bizarre comic book. I wonder whether fans of Japanese comics would find it offensive now, or just be as nonplussed as I am. I was unable to find anybody that had anything to say about it on the web, but this came close. Radio Boy is good silliness.